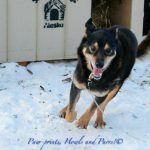 Grease is a former sled dog who has completed the Iditarod 5 times! He is now adopted into a retirement home with a kind caretaker. Straw For Dogs provided a heavy duty doghouse, a cable run to replace the heavy chain he had, food and treats. Grease is a sweet old boy and we are happy to help him in his golden years.